Temple Beth El Israel Synagogue, Port St. Lucie. 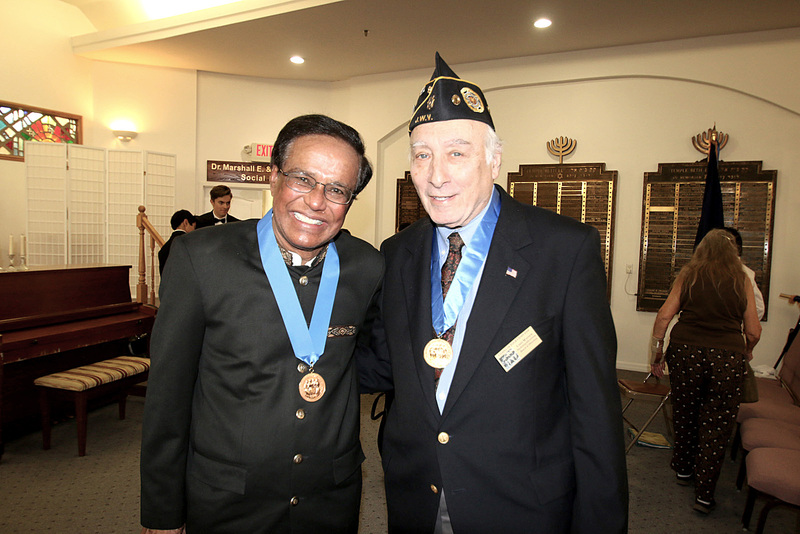 On Feb. 5, at Temple Beth El Israel Synagogue in Port St. Lucie, a man known and loved throughout the community was given a very prestigious award — and no one deserved it more. The Four Chaplains Award was inspired by the actions of four Army chaplains, representing different faiths, in World War II. On the fateful night of Feb. 3, 1943, the USAT Dorchester, carrying just over 900 troops, steamed toward Europe. A German U-Boat fired a torpedo, striking the ship below the water line, and she sank in just 18 minutes. Wounded and panicked soldiers were everywhere. Without regard to race or religion, the four first lieutenants organized the escape to topside, calmed the panicked ones, helped the wounded to the upper deck and handed out life jackets. When those ran out, the chaplains gave their own away. The Four Chaplains were Rabbi Alexander Goode of the Jewish faith; Father John Washington, a Roman Catholic priest; the Rev. Clark Poling of the Dutch Reformed faith; and the Rev. George Fox, a World War I veteran and Methodist minister. These men knew each other already from Army Chaplains School at Harvard University, and were good friends. Each knew they faced danger wherever they went, but each felt bound to serve God and their fellow troops in any way that was asked of them. Witnesses who saw the four chaplains singing and praying together, arm in arm, as the ship went down, said it was something that would stay with them for the rest of their lives. It’s that spirit that inspired the forming of the Four Chaplains Foundation, and the subsequent medals given around the country to those who serve their community without regard to race, creed or religion. Dr. Singh exemplifies that service to the highest degree. He has given all his energy and a good deal of his own money to the Honor Flight, having been a guardian for veterans for more than a decade. He’s hard to miss on Honor Flights, in his colorful and patriotic outfits and his ready smile. No veteran escapes his notice, and he stays in touch with them constantly. He has supported The Van Duzer Foundation, Creature Safe Space, Boys & Girls Clubs, LifeBuilders of the Treasure Coast, Heathcote Botanical Gardens, HANDS of St. Lucie County, and Boy Scout Troop 772. 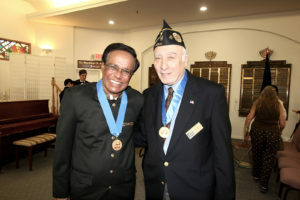 The ceremony Feb. 5 was well attended, with upwards of 300 coming out to celebrate Dr. Singh. Air Force veteran Cathy LaValle of the United Veterans of St. Lucie County was master of ceremonies. The Treasure Coast High School JROTC provided the Color Guard, and they were a poised group. The Lincoln Park Academy, Fort Pierce, provided music by its orchestra and chorus, under the direction of George Rahming. I can tell you — when they sang the national anthem, this callous and jaded journalist shed more than one tear. It was absolutely one of the most beautiful renditions ever. The same with “America the Beautiful.” It is still ringing in my ears. As part of the ceremony, the saga of the chaplains’ fateful journey was read by Rabbi Bruce Benson, Temple Beth El Israel, who also gave the invocation; the Rev. John Barnett of First Congregational Church, Port St. Lucie; Father Victor Ulto of St. Bernadette Catholic Church, Port St. Lucie; and the Rev. Robert Hunter, of Faith Congregational Church, Port St. Lucie. Each clergyman lit a candle of remembrance for each of the four chaplains. Veteran Larry Wapnick, a board member of the Chapel of the Four Chaplains, made a special reference to Coast Guard Steward’s Mate First Class Charles W. David Jr., a black sailor aboard the cutter USCG Comanche. David personally rescued 25 men from the sinking ship. Sadly, he died of pneumonia seven weeks later. Wapnick attended the dedication of the Coast Guard Cutter Charles David Jr, in 2013, which is homeported in Key West. None other than the CEO of the Chapel of the Four Chaplains in Philadelphia, retired Navy Capt. Louis Cavaliere, made the award presentation. “It is my privilege and honor to present this award to you, sir. You have given so much to your community, and you truly represent ‘interfaith in action,’” he said. “You have done so much with your own ‘lifejacket.’ You’ve taken that ‘lifejacket’ and done some extraordinary things. Let us all follow your example. Dr. Singh, a modest man, chose not to make any remarks — but he really didn’t have to. His actions have spoken louder than any words. After the ceremony, he was mobbed by well-wishers. It was lovely to see. Congratulations and thank you, sir. I feel a better person for have shared in your well-deserved award. Veterans are all around us. At a glance you might notice them —those that keep the high and tight haircut, or proudly wear ball caps or shirts announcing their service. Not all are so noticeable. Phil Galdys, our publisher, sometimes wears a nametag with Veteran Voice when he’s out and about. Folks ask him about it and tell him they’re veterans. Say, a woman Galdys encountered checking out groceries at the store. “Come to find out, she’s got 20 years in the Navy,” Galdys said. “Here’s somebody who’s an unassuming (grocery store) checkout clerk, and had it not been for her starting our conversation I would have no idea she’s got two decades of experience in the Navy. She shared that with me because I happened to be wearing my name badge. Her average, everyday customer has no idea. That got Galdys thinking. He’s also the staff photographer for Southeast Florida Honor Flight. He has taken thousands of pictures of the men and women from World War II and the Korean War. “I had a strong desire to do more for not only our veterans from those early wars, but to include those men and women who have served our country since then,” Galdys said. He lives in Stuart, about 90 miles south of Patrick Air Force Base. “There are no military bases in our immediate area, so the military and veteran visibility is not as prevalent as it is further north,” he said. But, sometimes that just means they’ve become routine, unnoticed. “Depending on where they’re located, they may blend into the background,” Galdys said. Galdys, a Gulf War-era Army veteran, decided to use his photography experience to help tell veterans’ stories to one another, and to the 92 percent of the adult population that’s never been in the military. He launched Portraits of Patriots to do just that. Galdys simply wants to take portraits of veterans within our communities. Veteran Voice will publish some of those portraits throughout the 2017 calendar year. Additionally, social media will play a part as the paper develops Facebook and Instagram pages to reach a larger audience and bring more awareness. Additionally, the participating veterans will get digital copies of the photos. “The portraits are intended to be more than just snapshots,” Galdys said. 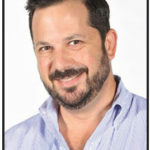 He will set up photo locations throughout each county where the veterans will have their portraits taken against backdrops and studio lighting. For now, the project is starting on the Treasure Coast, mostly Martin, St. Lucie and Indian River counties. Over time, Galdys will head north with Portraits of Patriots into Brevard, Seminole and Volusia counties. If you, a family member or a friend has served our great country with military service and wish to be considered, visit www.portraitsofpatriots.com.